I hope you are having a fabulous week! Today I wanted to share about Thrive Moms. If you haven’t heard of them you will love them. If you have then you know why I love them. They are moms and wives just like you and me encouraging us daily. They motto Empowering Imperfect Moms with His Perfect Grace. Don’t you love that!! I am most definitely an imperfect mom needing his perfect grace daily. Thrive is a ministry for moms to encourage and inspire you to do more than just survive motherhood. We believe God wants us to THRIVE and walk confidently in who He calls us to be as mothers. I love everything they share about motherhood, health, and being You in the eyes of Christ! When I am praying for direction in a step the Lord seems to be leading me to and I am always comforted and encouraged when I read the blog posts Thrive Moms shares. They also have Thrive Local groups for moms to get together and just walk this journey together building each other up. Check it out to see if there is a local group near you. I just love what Thrive Moms stands for and I love the passion they share as believers and moms. I purchased on of the Thrive Moms tumbler cups and today and I want to share that with you! Enter below and one lucky reader will win this super cute cup! If you can’t wait and want to order one today you can right here! How often do you go an entire day without even remembering to take a sip of water? As moms we are so focused on making sure our little people are taken care of and getting a healthy, balanced diet. But what about YOU, mama? This beautiful 20oz tumbler will make drinking water fun again! 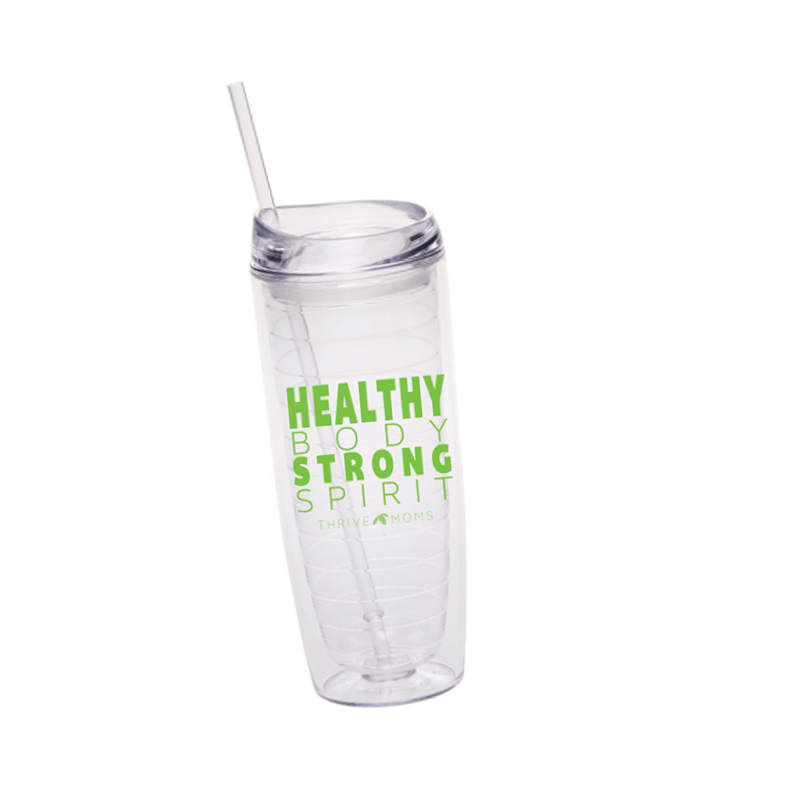 To go along with our “Healthy Body, Strong Spirit” campaign to focus on your health, this cup is a perfect reminder to take care of YOU! Learn more about the Health Body + Strong Spirit campaign here. All proceeds from this cup help support the ministry of Thrive! We appreciate you keeping us going and allowing up to encourage and support you in your motherhood journey! Thanks for the giveaway! Somebody accidently broke mine when they were giving me a hug, hehe. Thank you Karrie for stopping by! Oh I’m sorry it broke but those hugs sure are priceless, right! Good Luck! I like this tumbler and what it stands for. I would like it as a reminder to take care of myself as well as my family. I also like that this tumbler helps support the ministry. I WOULD LOVE ❤️ TO HAVE THIS TUMBLER. Thanks Christin! I completely agree with you! Good Luck!